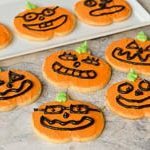 Jack O Lantern cookies - pumpkin shaped sugar cookies decorated with buttercream frosting. Make them for a great Halloween treat. Sift together flour, baking powder, and salt. Set aside. In the bowl of an electric stand mixer, add butter and sugar and beat until light in color. In a small bowl, add egg, milk, and vanilla and whisk to combine. Add the egg mixture to the butter/sugar mixture and beat to combine. Put mixer on low speed and gradually add flour, beating until just combined (do not over-mix). Divide the dough in half, wrap in waxed paper, and refrigerate for at least 2 hours. Sprinkle surface where you will roll out dough with flour. Remove 1 wrapped pack of dough from refrigerator and let it soften slightly (about 10 or 15 minutes). Sprinkle rolling pin with flour and roll out dough to 1/4-inch thick. Move the dough around frequently to make sure it is not sticking. Use a pumpkin shaped cutter to cut cookies. Place cookies at least 1-inch apart on a baking sheet lined with parchment or silicone baking mat. Bake 7 to 9 minutes, until cookies are just beginning to turn brown around the edges, rotating cookie sheet halfway through baking time. Let cookies sit on baking sheet for 2 minutes after removal from the oven and then transfer to a wire rack. Cool completely. Repeat with remaining dough. In a large bowl, add the butter, salt, and vanilla, Beat using an electric mixer until creamy. Add the sifted powdered sugar and 3 tablespoons milk. Beat until smooth, adding more milk as needed for spreading consistency. Take about 1/2 cup of the frosting and place it in a small bowl. Stir in green food coloring gel, a small amount at a time, until it has reached desired color. Add more milk if needed for piping consistency. Take about 1 1/2 cups of the frosting and place it in a small mixing bowl. Reserve and set aside. Stir in orange food coloring gel, a small amount at a time, to the remaining frosting in the large bowl until it has reached desired color. Spread frosting over cookies. Mix more orange frosting from the reserved bowl as needed. Pipe the green frosting on the top of the cookie (stem) using a leaf tip. Add some sifted cocoa to the remaining reserved frosting and beat until combined. The amount depends on how much frosting. About 1 teaspoon per cup. Stir in black food coloring. Note that the frosting in the bowl will look more dark grey than black. It takes a good bit of black coloring to get it to the right color and it helps starting out with a chocolate frosting base. Pipe the black frosting on to the cookies using a #3 round tip to make the "faces". Store cookies on a platter in the refrigerator. If you need to stack them in a container to store, place parchment between layers.